Early Warning: Is Europe Recovering Yet? 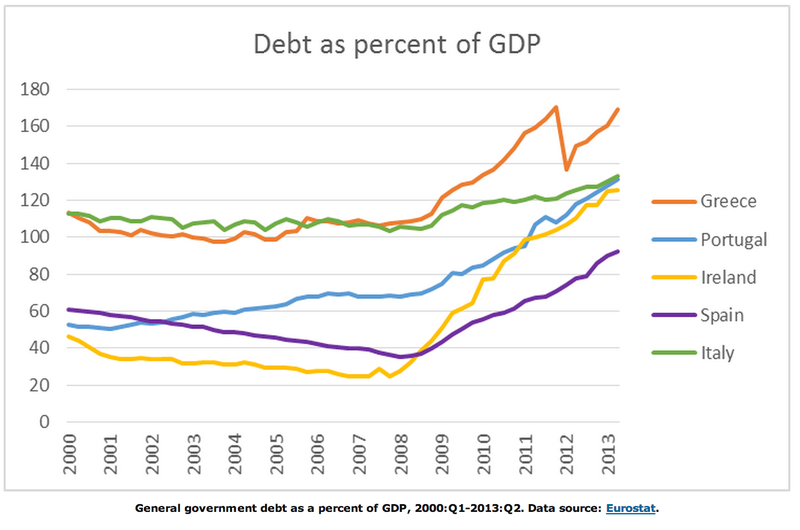 Something that doesn't seem to have been in the news much of late is the state of the European economy. 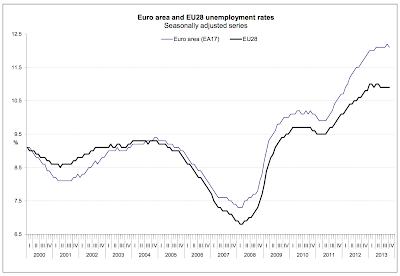 I was curious to catch up on this, so here is a short graphical summary of the latest official data (from Eurostat). 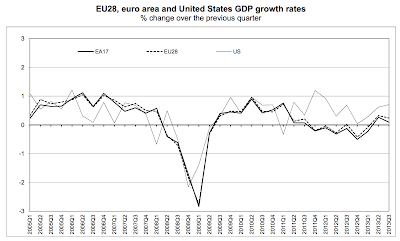 The data in most graphs start at the beginning of 2005 or last quarter of 2004 - so they show decent growth for the first year or two, then the onset of the great recession in late 2007 and 2008, then the partial recovery of 2009/2010, which ended in a second decline in 2011. 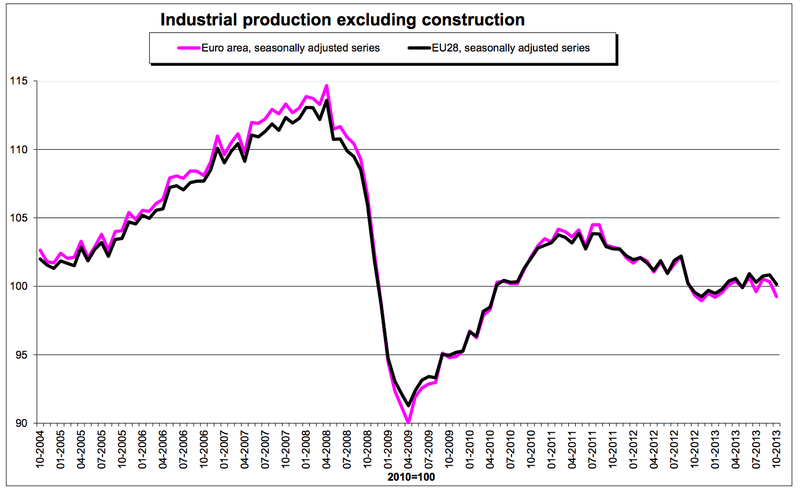 Here, first, is Europe-wide industrial production, which shows a very weak recovery in 2013, though most of the very slight gain was lost in the last couple of months of data. 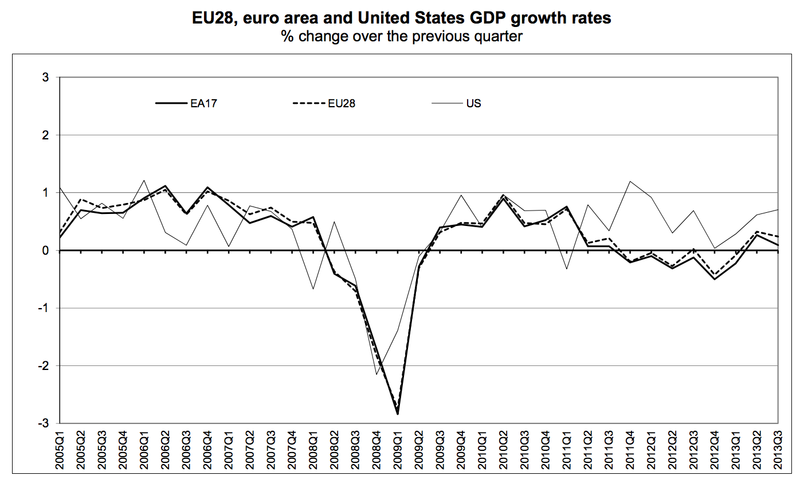 Q2 and Q3 of 2013 were the first clearly positive quarters in quite a while, but growth was still extremely weak, and in particular much weaker than in the US, which has not incurred a double-dip recession in the same way (though growth has not been exuberant there either). 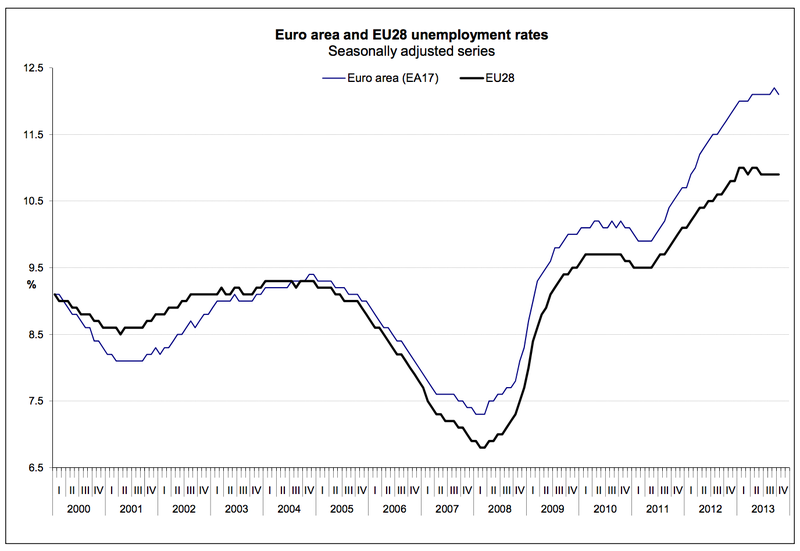 European unemployment has stopped getting worse in 2013, but has not really started to go down on a continent-wide basis. Ireland and Portugal have clearly improved in 2013. Greece and Spain have stabilized (at terribly high levels) but not started to improve, and Italy continues to worsen apace. Despite this, central bank guarantees are keeping sovereign interest rates moderate. Overall, it seems that the European economy has stopped getting worse in 2013, but the "recovery" is so weak and patchy as to barely justify the name. Still, there now seems little prospect of an imminent turn for the worse, and that's a considerable blessing and no doubt explains why the subject has disappeared from the news. 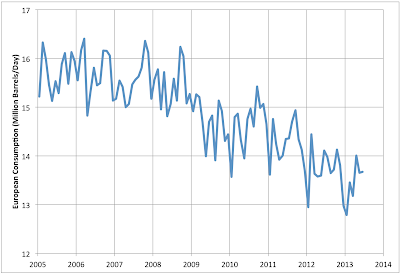 This is out of about 85-91 mbd or so of global liquid fuel production during this period. 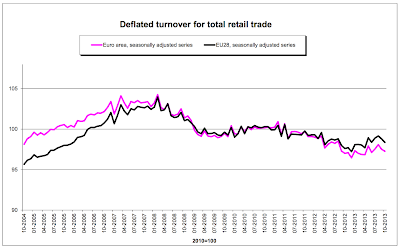 If Europe had recovered strongly after the great recession, we might conjecture that consumption would be back to 15-16 mbd, instead of being 13-14 mbd. Global prices would probably be noticeably higher in consequence. I believe that in Europe, it is important to add the different energies to get a right picture of the situation. There is a huge shift from oil to electricity and natural gas in house heating. There are also important energy efficiency improvement on cars and trucks (my new car, 10 years after, same model, uses about 25% less petrol)and the governments really invested money to get people to replace cars that are more than 10 years old. Best regards, congratulations for your blog. With the exception of Ireland, one thing this group of highly indebted nations have in common is a horrible demographic growth profile, with major implications for growth and thus debt sustainability. It's also pertinent that the demographics are lousy even before you factor in accelerating emigration. 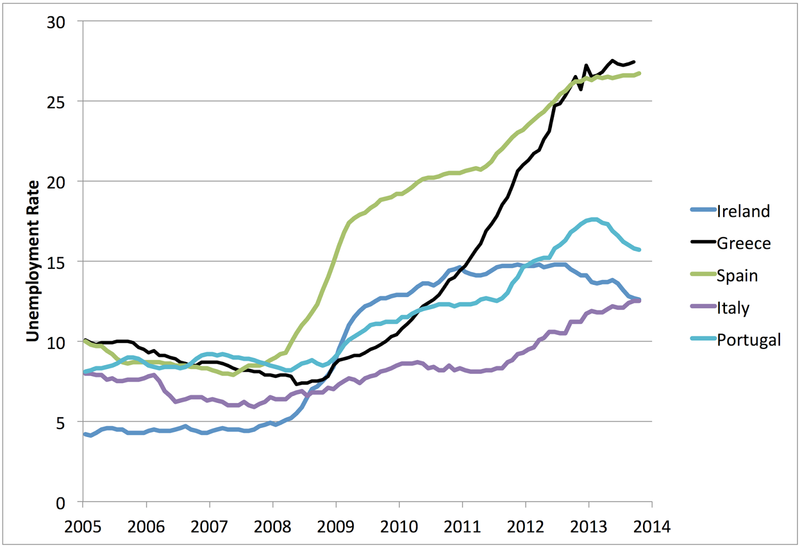 However, unemployed southern European youth are also heading north. See for example this article in The Guardian on the UK's latest migration data. "The main increase in immigration has come from migrants from the battered southern European eurozone economies of Spain, Italy, Portugal and Greece. The number of people coming to work in the UK from Spain rose by 40% to 49,800 in the year to September, according to Department for Work & Pension's national insurance data shows new registrations. The numbers from Italy increased by 52% to 39,400; from Portugal by 45% to 28,300; and from Greece by 31% to 9,300." 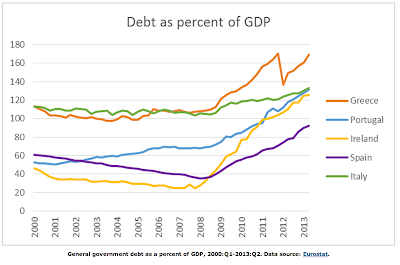 Basically, you can't stabilise debt unless you can buttress growth. And for that you need a growth policy not just an austerity policy. 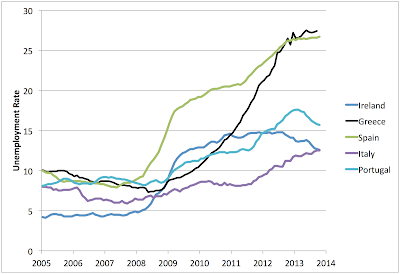 Oil production from UK continues to decline. 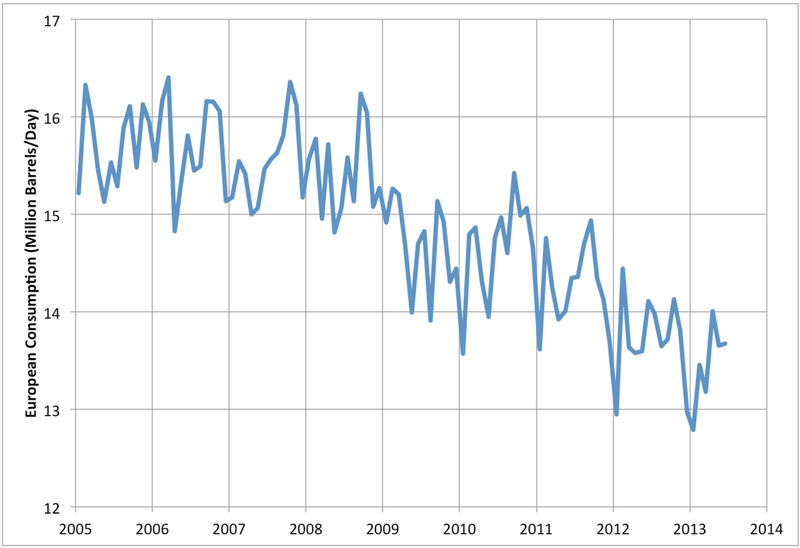 Norway's production has shown a recent uptick, however there has been a decade long decline in production. I have found that making comparisons between countries is very difficult as the level of manipulation varies so greatly. I found this when I moved to Canada and realized that the retirement fund surpluses (they call it the CPP here) were kept separate from the government balance, while in the US they were mixed. Of course the Canadian press went on and on about how bad the deficit was without correcting for the large difference in accounting. The quality of the US statistics has got so much worse over the past 2 decades, always of course in the politically "good" direction, that I have to significantly discount them. With the CPI and GDP Deflator being open to so many changes I consider that the real US GDP figures are seriously overstated, perhaps not as much as Shadowstats state, but still quite significantly. The use of "quality adjustments", which never seem to take into account of the reductions in quality (like never finding a human being when calling a company, having to pack your own bags at the supermarket, "self service" transferring effort from the seller to the customer), and overstate the positives (my cpmputer having wtice as much memeory may be no benefit if needed to run Microsofts latest bloatware loaded with functions I never use), is bad enough. The worst though is the adjustments to the weightings of goods in the basket to reflect "consumer preference". If gas costs more we use less so it gets a lower weighting, if beef gets too costly so I eat more pork the weightings get changed. In this way we could all end up eating cat food because everything else has gone up in price but there would be no reported inflation! Then of course we have the faked unemployment numbers just before the last US election. I may be naive, but I still see the quality of the European stats as being somewhat better than the US ones. Unfortunately, the UK now seems to be into the game of playing with the CPI too, of course the unemployment numbers became pretty meaningless during the 1980's depression. Sorry for such a long comment, but I see so many such comparisons that take the statistical "facts" as given rather than discounting the worst abusers. I perhaps incorrectly think of it as part of the same changes (to counting GDP) but to count software not as simply a cost but an investment seems correct to me.